ShareItMobile is a turnkey, dual-platform (mobile app and web) branded hosted social media solution that automates and streamlines the aggregation and presentation of user generated content (UGC). The ShareItMobile platform is available in two product configurations: SiM UGC and SiM AdTag. Either product can be launched independently, or the products can be combined as a single platform that lets you collect, manage and present UGC from your community alongside sponsored updates from local SMB (small and medium sized business) advertisers. Copyright © 2012-2018 ShareItMobile, LLC. 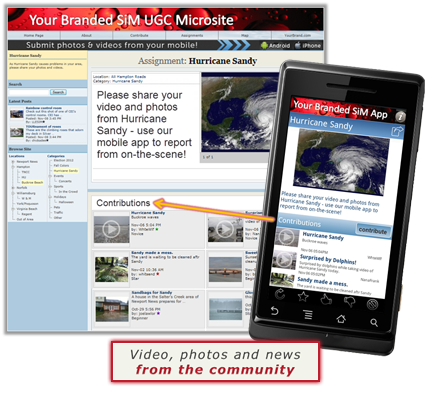 SiM UGC is a citizen journalism and crowdsourcing platform for media companies that want to collect and leverage photos, video and news stories from the community-at-large. 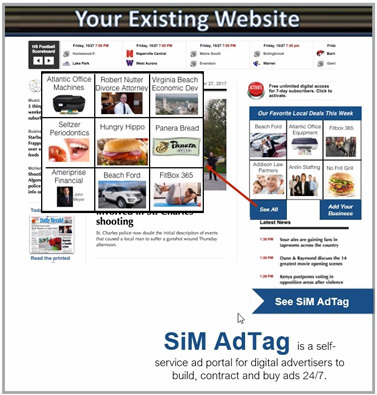 SiM AdTag is a digital social advertising platform that gives media companies a unique source of incremental revenue from letting advertisers reach their audience with real-time social updates made via mobile or web, including video and photos.